How can one go wrong with a classic? You can’t, and especially when the recipe comes from my grandma, Mrs. Laura Hess. Grandma was a seasoned wedding cake guru and was locally known for her baking. If you were going to a wedding in the DC metro area, you could bet that the cake was a Laura Hess creation. 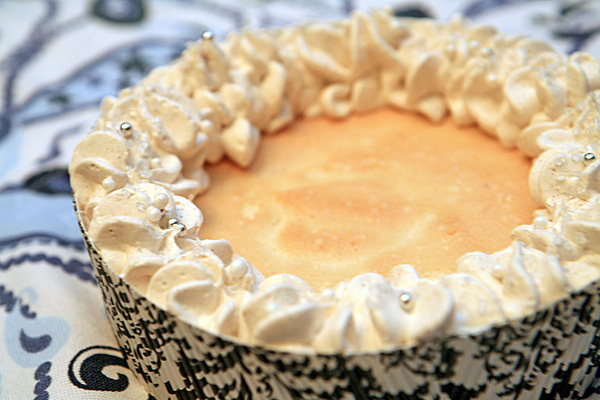 For a long time, I was intimidated to make her famous angel food cake recipe. This past holiday season, I felt moved to just do it, and try to recreate the taste of my grandmother’s kitchen. I am so glad I did, because it’s now a favorite among family and friends. Of course, you can top the cake with the norm: Fruit and Cool Whip, but you also have to try it with my grandmother’s homemade Cinnamon Whipped Crème. It’s warm and refreshing. Preheat your oven to 325. Beat the egg whites with the vanilla, cream of tartar, and salt in a large bowl, using an electric mixer on medium. When the mixture becomes foamy and very soft peaks have started to form, slowly add in ½ the sugar. Beat just until soft; moist peaks should form. Remove from the oven and allow to cool for 1 hour. Remove the cake from the pan by using a knife to move along the edge, separating the cake from the pan. Place a plate on top and turn the pan upside down. The cake should slide out and onto the plate. Transfer cake to serving platter and top with Cinnamon Whipped Crème. With an electric mixer on medium speed, whisk heavy cream and vanilla until stiff peaks form. In medium prep bowl, whisk together mascarpone, confectioners’ sugar, and cinnamon until very smooth. Gently fold whipped cream into mascarpone mixture until completely incorporated.